This decade might just mark the first time that Americans embrace the tiny, European-style car–mostly out of economic necessity, natch. Tata recently announced that its ultra-cheap Nano vehicle will go on sale in the U.S. sometime in the next few years, and now Norwegian EV maker Think has announced that its Think City EV will be assembled in an Indiana production plant. The two-seater hatchback EV has already been on sale in Europe for the past year, with 1,500 of the cars currently on the streets. The car is reasonably priced at about $30,000 and has a tough plastic body. It doesn’t go too fast, maxing out at just 70 mph, but it does have a range of 112 miles. That makes it ideal for daily commutes. It also makes the car the antithesis of the Tesla Roadster, a $109,000 sports car EV with a top speed of 125 mph. 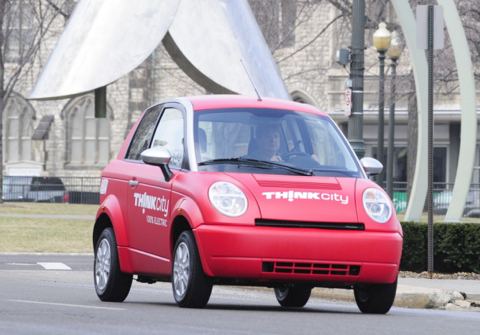 The Roadster and the Think City are the world’s only two crash tested and highway certified EVs. Now that Elkhart, Indiana has been chosen as the production site, Think expects to have cars coming off the assembly line as early as 2011. By 2013, 20,000 cars a year will be produced at the factory. Early adopters won’t have to wait that long, however. Think will begin importing its vehicle from a Finland assembly plant for American customers later this year. It probably makes more sense to wait until Think begins manufacturing it’s car here–by that time, the U.S. may at least have the beginnings of an EV charging station infrastructure.